This Calculator serves the calculation of average flow velocity and flow rate in rivers, creeks and canals when the characteristic of the flow cross-section is known. All input fields (white background) are filled out from the start, these values can be changed according to the individual requirements. The calculated values are output in the green fields after a click on "Calculate" or pressing the enter button. The Calculation is based on the formula of Gauckler-Manning-Strickler. The Strickler-coefficient kST is a so-called roughness-coefficient. The larger this coefficient, the smoother is the channel bed and the lesser resistance is put against the flow. Therefore flow velocity increases with growing Strickler-coefficient. Newly concreted channels have a very low roughness, whereas naturally or near-naturally rivers and creeks show a higher roughness, especially if they are characterised by dense bank vegetation and/or big stones. In this calculator the Strickler-coefficient is output in the field "kST" after selecting the category. The value can be changed as required. Slope expresses the proportion of height difference and distance. It is indicated in percent usually. 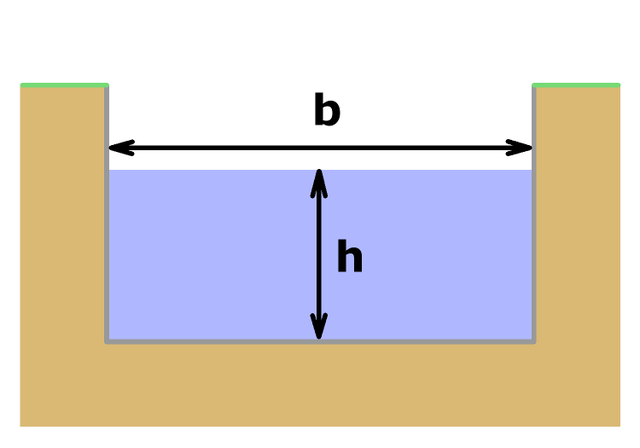 Slope provides the energy for the motion of the water. Therfore flow velocity increases with growing slope. Flow velocity also depends on the ratio of flow cross-section and wetted extent. This Calculator allows the selection of simple flow cross-sections. 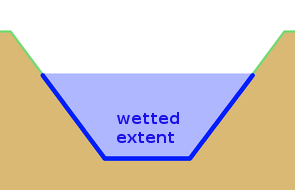 Cross-sectional area and wetted extent are calulated. The calculated values for average flow velocity and flow rate are approximate values. Deviations from the true values are possible. In case of greater water depths the calculated values may be to high, especially if slope is large at the same time.